Keenpac has joined forces with department store House of Fraser to launch branded packaging for the Biba clothing range. Biba was one of the iconic brands of the 60s and the watchword for cutting edge design and style, so when House of Fraser asked us to help develop the packaging for the range, we couldn’t wait to get started. And the results have been stunning. Deep black, teamed with gold satin, the theme is carried through the packaging range giving a backwards glance to the sensuous 60s with a modern twist. 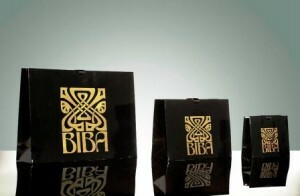 The Biba Collection and its branded packaging will be available in 33 House of Fraser Stores and on-line from September 2010, and promises an exciting future! Branded Carrier Bags | New Bags Please! As well as the crossword comp we had a 'Dippy' egg lucky dip. Today we had Keenpac Easter with a Easter themed team crossword competition. Congratulations to our winning team - Debbie, Tahir, Dan, Warren and Dean. Second Prize went to Gordon, Darren, David, Rae and Jeni. Keenpac is a trading division of Bunzl Retail and Healthcare Supplies Limited. Registered in England No 62537.